← Lakes Hub Bulletin #218. After a couple of short months, where we were firmly buried in planning, funding applications and working out fun events for the rest of this year, we seem almost ready to come up for air. I spent two days this week on a stall at the International Rural Women’s Conference. Although I did not attend the talks, many of the presenters spoke to me afterward with regard to water and food security. The autumn seasonal change has arrived, resulting in some amazingly still days on the lake. These still days are a reminder that Autumn really is the best season to get out and explore our wetlands via my favourite mode of propulsion— paddle power. There are at least four events mentioned within this newsletter, which have paddles involved. School holidays are approaching, with a number of fun activities planned. The next Bulletin is scheduled for release the day before the holidays start, so it should be full of fun activities for the kids. 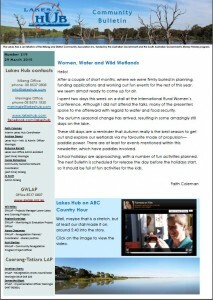 This entry was posted in DEWNR, Events, Forums, History, Lakes Hub Bulletin, LakesHub, Meningie, Milang, Newsletters, Uncategorized, Videos, Water, ph & salt levels. Bookmark the permalink.